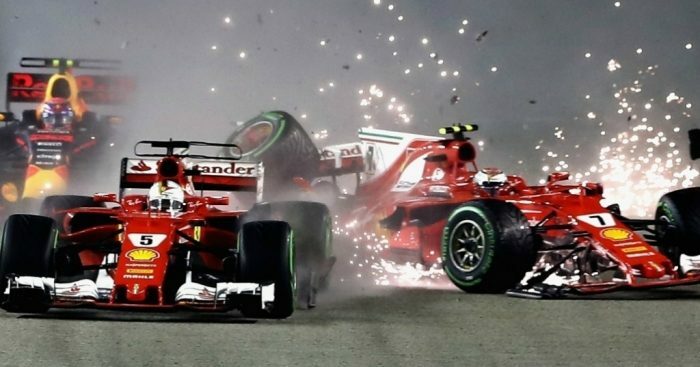 The race stewards have concluded that there was ‘no driver was predominantly to blame’ for the collision between Sebastian Vettel, Max Verstappen and Kimi Raikkonen and no futher action has been taken. Verstappen was sandwiched in between the two Ferrari cars as Kimi Raikkonen tried to pass the Dutchman on the left-hand side and Vettel came across to try and cover from the right. The early moves off the line led to all three colliding at first, before Raikkonen and Verstappen came together again Turn 1 when the Finn lost all control. Vettel tried to continue, but the damage sustained led a big fluid leak, causing him to lose all control on the slippy surface and lose a front wing when he went slamming into the wall. All three retired on the first lap and it could prove to be particularly disastrous for Ferrari, who have lost big ground in both World Championships as eventual race winner Lewis Hamilton opened up a 28-point lead. ‘The Stewards examined video evidence and heard from Sebastian Vettel, the driver of Car 5, Kimi Raikkonen, the driver of Car 7, Max Verstappen, the driver of Car 33 and the team representatives. ‘Driver of Car 7 had a very good start and was able to attempt overtaking of Car 33 on the left hand side. At the same time, Car 5 which had a slower start, moved to the left hand side of the track; Car 33 and Car 7 then collided resulting in a chain collision with Car 5 and ultimately Car 14 (Fernando Alonso) at the next turn. Cars 7, 5 and 33 had to retire immediately as a result of the incident; and Car 14 retired some laps thereafter.